Click here to view a pdf on why codes sometimes require sidelites and transoms to have higher ratings than door openings. When the code requires fire doors rated 1-hour or more, then the sidelites and transoms around that door must be fire resistive and rated to the same standard as the wall itself (e.g., 1- or 2-hour). Sidelites and transoms around a 20-minute fire door in a 1-hour exit require a 45-minute fire rating with hose stream. Why does the rating have to equal that of the wall, and not the door opening? Unlike a door, which is actively opened and closed, and has a limited surface area, fixed panels present a greater radiant heat risk. Combustibles cannot be stored against an operable door, but can be stored against a fixed sidelite. Additionally, a door opening has a limited surface area, whereas a fixed sidelite and transom is limited only by the size in which it can pass the fire test. 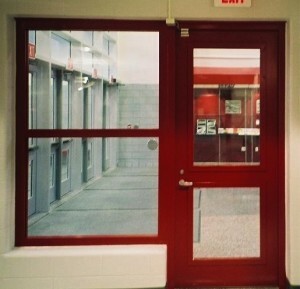 Because of the concern about fire spread due to combustibles igniting from high levels of radiant heat, safe fire protection engineering principles dictate the limited use of fire protective materials in 60-and 90-minute doors to the door vision panel, and require glazing around the door to meet the requirements of the wall itself. Does that mean sidelites and transoms cannot be used around 60-and 90-minute doors? No, but the fire rated glazing used must be a fire resistive rated material (NOT wired glass or ceramic, which are fire protective materials). In addition, the rating of the sidelite and transom must equal that of the wall, not of the door opening. Click here to download Table 716.5 from 2012 IBC. What is the difference between a fire protective and fire resistive glazing product? Fire resistive glass has the ability to significantly limit radiant heat transfer, having been tested to ASTM E-119, the more stringent fire test requirements of a wall. Fire protective glazing cannot limit radiant heat or meet ASTM E-119. Indeed, many fire protective materials allow dangerous levels of radiant heat flux to pass right through the glazing in the first few minutes of a fire. Click here to learn more about the dangers of radiant heat transmission. In general, fire protective products can be used for 20-45 minute applications and fire resistive products can be used in applications over 45 minutes. 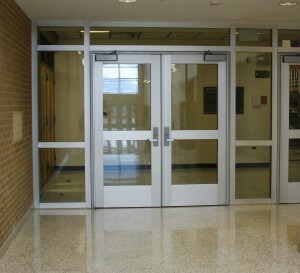 90-minute doors and 2-hour wall in a 2-hour exit passageway at Freedom High School, Bethlehem, Pennsylvania. Products used: SuperLite II-XL 90 (doors) and SuperLite II-XL 120 (walls) in GPX framing. Both glazing products are fire resistive, block radiant heat, rated 90- (doors) and 120- (sidelites, transoms) minutes with hose stream, impact safety rated to CPSC Cat II, and meet ASTM E-119.